Cambridge Road on the west side of Delaware will be repaved from Lexington Bouelvard through Bridegport Way. 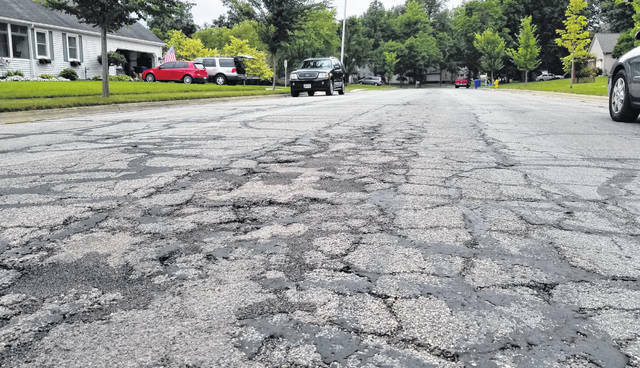 Four streets and a bridge will get pavement or maintenance work as part of the City of Delaware’s upcoming 2018 resurfacing program. Work begins this month. A total of $1 million in local and state funds will be spent, including $450,000 from Delaware. The work includes new pavement, crack sealing, striping or base repair. Heffner Street, Winter Street and Blymer Street will receive full-width resurfacing. Existing pavement will be removed by a grinding machine. Several days later, new pavement will be put down with a paving machine. Cambridge Road will be repaved. The Winter Street Bridge will get surface repairs and masonry work, as well. • Aug. 6-10: Heffner Street base repairs. Parking restrictions will be required in work areas and will be posted. • Aug. 8-24: Winter Street bridge repairs. The bridge will be closed to vehicle and pedestrian during work. • Aug. 13-24: Cambridge Road paving from Lexington Boulevard through Bridgeport Way. Cambridge will be closed to through traffic during this period. Local residents will have access to their properties by the end of each work day. Delaware City Schools will contact parents if any changes are made to bus stops in the area. • Sept. 3-21: Paving milling and resurfacing on Heffner Street (Euclid Avenue to Sandusky Street), Winter Street (Franklin Street to Central Avenue) and Blymer Street (Lincoln Avenue through Fountain Avenue). Periodic parking restrictions will be posted. Traffic will be maintained during milling and paving. The type of state grant money obtained by the city is not released until early August. Because of this, there was no way to complete the work before the school year begins.